This article is about the Brawl stage. For other uses, see Summit (disambiguation). Summit as it appears in Smash. Summit (頂上, Summit) is a stage in Super Smash Bros. Brawl and Super Smash Bros. Ultimate. It starts on an icy mountain top which Masahiro Sakurai, the director, describes as being the summit of Icicle Mountain, a stage that appears in Super Smash Bros. Melee. The stage was revealed on Smash Bros. DOJO!! on October 31, 2007. In reference to Halloween, one image featured a pumpkin. In Ultimate, Ice Climbers are fought here for their unlock battle. The mountain has several linear platforms on the top, and the leftmost can be unhinged, temporarily disabling it. 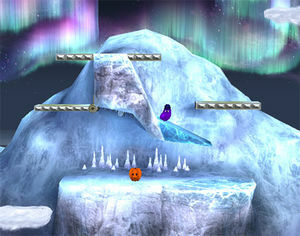 There is a blue sloped platform of ice to the right, which can be broken, as well as a small "cave" at the bottom, with an icicle occasionally falling, causing high knockback and damage. When not surrounded by water, a cloud platform will occasionally pass by, which players can stand on. As the entire bottom of the stage is made of ice, the edges at the bottom cannot be grabbed (Brawl only), and naturally, the floor is extremely slippery, especially when a character attempts to change direction rapidly. The Ice Climbers are the only characters who can walk normally on the stage without sliding. Several vegetables from the original Ice Climber will make an appearance acting as Food Items. The vegetables appear in the order they do in the original game, namely an eggplant, carrot, cabbage, cucumber, corn, turnip, pumpkin, Chinese cabbage, potato, and a mushroom. They all restore 5% health with the exception of the corn, which restores 10%. They will not appear if Food is turned off or item frequency is set to none. The stage begins on top of the mountain, but then breaks and begins to slide down a hill. In Brawl, during the descent everybody becomes much more floaty, however this was removed in Ultimate. The key factor to survival is to remain on the iceberg, as making contact with the left side of the mountain will result in being hit by the iceberg for high knockback and damage, and contact with the ground to the right side will result in the being carried away to the right blastline and being KO'ed. It is possible to jump off of the ground on the right side in spite of its speed, but this must be done very quickly. Eventually, the peak splashes into water, reducing the possibility of getting KO'd on the bottom blastlines; however, the water is also where the fish lives. Originating from Balloon Fight, the fish is a major hazard on this stage; players who fall in the water must quickly jump out, as any character that remains in the water too long will be eaten by the fish, KOing them. Little segments of ice will also float by in the water; standing on these can help avoid the fish. Fortunately, in Ultimate, it is now possible to escape from the fish's mouth by button mashing. As time progresses, the stage slowly sinks, due to weight from the Polar Bear in the background. After a while, the iceberg flies back up to the top of the mountain and the whole process is repeated. In Super Smash Bros. Ultimate, the Ω form and Battlefield form are set on a floating iceberg that is the same size and shape as Final Destination and Battlefield, respectively. The three soft platforms in the Battlefield form are based on the metallic platforms in the normal form. The giant fish as originally seen in Balloon Fight, eating one of the enemies. Cover artwork of the Famicom release of Ice Climber. While this stage doesn't come directly from Ice Climber, there are elements in this stage that do come from Ice Climber. In Ice Climber, there are points in the game where the player has to jump on clouds that move across the stage and act as a moving platform. The first part of this stage features a cloud that floats by and acts as a moving platform. One of the enemies in Ice Climber are Polar Bears. If a player takes too long to beat a level, the Polar Bear will appear and jump to make the screen scroll up. In this stage, when the stage is in the water, a Polar Bear can be seen in the background. The Polar Bear jumps and makes the stage go deeper in the water. In the later levels of Ice Climber, there are icicles that start forming and dropping on the player. If the player gets hit by an icicle, the player loses a life. The icicles that form and drop are retained on this stage. If the player wants to get bonuses at the end of each level in Ice Climber, the player has to get all the vegetables near the top of the mountain and complete the level within a set forty second time limit. The vegetables that are shown for each level are eggplants, carrots, cabbages, cucumbers, corn, turnips, pumpkins, Chinese cabbages, potatoes, and mushrooms. In this stage, these vegetables can appear and can be eaten to heal some damage. In Balloon Fight, there is a giant fish that can eat characters if they get too close to the water, or if they fall in the water after all their balloons have been popped. This giant fish can be seen in this stage when a player is close to the edge of the stage, or when a player jumps in the water. If the player doesn't get out of the way in time, the fish will jump out of the water and eat them. This stage is banned in tournaments, due to ungrabbable edges, slippery surfaces, and powerful camping spots at the bottom of the stage, as well as the fish stage hazard. Also, the blue ice platform and the leftmost platform allow for wall infinites. The top stage beginning to break off. The stage reaching the water. The water level rising to ground level. Panorama of Summit from Ultimate. Fox in his helpless animation on the stage. The Ice Climbers using Squall Hammer on Captain Falcon on the stage. Kirby inhaling an Ice Shot in his Ice Kirby-inspired costume on the stage. Krystal using her Ice Blast move on Diddy Kong on the stage. Lucas freezing Ganondorf with PK Freeze on the stage. Fox, Palutena, and Samus struck by Lunala's Moongeist Beam on the stage. Mega Man using Crash Bomber in his red alternate costume on the stage. Pikachu using its down tilt on the stage. Rosalina & Luma taunting on the stage. Roy equipped with Superspicy Curry next to a frozen Wii Fit Trainer on the stage. Samus preparing her Charge Shot on the stage. Shulk taunting on the stage. Ridley, Jigglypuff, Ice Climbers, and Zelda on Summit in Ultimate. Olimar getting attacked by the fish in Ultimate. Villager taunting on the stage. Alolan Vulpix standing behind Fox on the stage. Neither the fish nor the polar bear have their own trophy in Brawl, despite the presence of trophies for most other stage elements. This is also the case with the Ultimate Chimera. 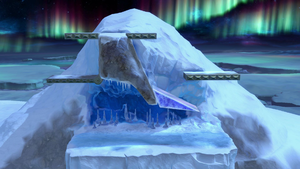 Despite Sakurai's description of this stage as the top of Icicle Mountain, its appearance is inconsistent with the Icicle Mountain stage seen in Super Smash Bros. Melee. This especially considers that the setting of Icicle Mountain in Melee is described as the "Infinite Glacier". However, an iceberg can be seen in the background of Icicle Mountain, which shows that the "Infinite Glacier" is not very infinite at all. If Sonic has a Bunny Hood, Superspicy Curry, and a Super Mushroom during a Giant Brawl, he can outrun the iceberg on Summit. If the player holds the shield button anytime before landing on the space in front of the iceberg while it is sliding, the character will perfect shield upon landing, resulting in no damage taken. Should the fish attempt to swallow Wario-Man, it will just pass him without swallowing. When the camera zooms in on the fish while a player has been swallowed, it will show the middle of the fish. In the PAL Spanish version of Smash 4, Temple originally had the name of this stage before it was patched to the name that was used in Melee and Brawl, "Templo". The stage's mountain is actually fully rendered at all times, with the stage loading different backgrounds depending on the main stage's location. This page was last edited on April 16, 2019, at 15:42.